Did you know you can get a DUI after participating in activities other than drinking? In fact, DUI stands for driving under the influence, and the “influence” can be anything that affects your ability to safely operate a moving vehicle. Of course, this definition includes alcohol, but it also refers to other mind-altering substances, such as marijuana. Recreational weed is now officially legal in California. Of course, just because pot’s not criminal, it doesn’t mean you’re free to go rogue with your roaches. After all, it’s completely legal to drink a six pack, but that doesn’t mean you can put the keys in the ignition after you finish your final brew. The same rules apply for weed (and weed-infused items such as edibles). How Do Police Measure BAC for Weed-Related DUIs? Unlike alcohol, there is no limit to mark marijuana impairment. Whereas with alcohol, you’re permitted to have a chemical threshold of up to 0.08% blood alcohol level before you’re considered to be driving under the influence, marijuana DUIs are purely based on police officers’ observations of the driver and the way he or she was driving. 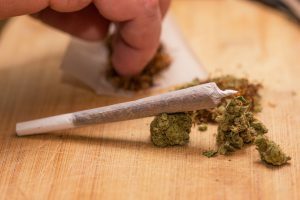 Without specific limits to dictate when a driver should be considered sober and when he or she is considered under the influence, weed-related driving arrests are difficult to prosecute. An officer may administer roadside tests similar to those people who are suspected of drinking and driving undergo, but the end result of the arrest lies almost entirely on the officer’s opinion of the situation. Some states have set thresholds on the permissible amount of THC drivers can have in their blood if they’re pulled over for a DUI. Colorado and Washington both allow up to 5 nanograms before a driver is considered impaired. Nevada’s threshold is at 2 nanograms. A nanogram represents a billionth of a gram per milliliter of blood. How Do People Get Pulled Over for DUI After Smoking Weed? Police officers are trained to look for certain signs of cannabis impairment. For example, a driver may not be maintaining a consistent speed. A driver is also likely to be pulled over if he or she isn’t able to stay within his or her lane. People who are under the influence of marijuana may be slow to react to stoplights turning green or gradually roll through them when they’re still red. If you’re only suspected of a DUI, roadside sobriety tests are voluntary. If you do submit to these tests and are arrested, you’ll be taken to jail and subjected to a drug recognition exam, which records things like your heart rate, blood pressure, pupil dilation, and temperature. These records will likely be used in court if the state decides to pursue charges. If you are arrested, ask for an attorney and do not make any statements. Have you been arrested for a DUI after getting high in Los Angeles? Don’t fight this battle alone. Jon Artz, experienced California DUI attorney, knows this state’s marijuana laws and will use his experience to bring the best possible resolution to your case. Reach out to Jon any time at (310) 820-1315, or fill out this online form.